You may know about Africa’s “Big Five,” but did you know there is a “Big Five of Manitoba?” The province of Manitoba lies directly in the center of Canada, making it one of the best places to experience the wildlife of Canada’s North. This prairie province is teeming with wondrous wildlife, including polar bears, black bears, bison, moose, and belugas. Not only can you see these amazing creatures in their natural habitats, but you can also help ensure they are around for centuries to come. Supporting tour companies who believe in sustainable travel practices gives back to the entire community, including the furry friends within the region. 1. You just don’t know how gigantic moose are until you see them in person. Moose, the largest of the deer family, can be anywhere from one and a half to two metres (five to six and a half feet) from hooves to shoulder—that’s not counting a raised head or antlers! Eating up to 30 kilograms (66 pounds) of food a day in the summer, it’s no wonder moose can weigh up to 600 kilograms (1322 pounds). You can find these behemoths wandering through woods, swimming in lakes and rivers, or foraging for food. You may also find their antlers, which can be over 150 centimetres (five feet) wide, on the floor of the boreal forest each winter. Moose shed their antlers each year, but grow them back in the spring. Despite their size, moose actually have a few predators. Black bears and wolf packs might not take down a healthy adult, but they target the young, sick, and old. However, it’s smaller predators that really do damage. Moose are susceptible to parasites, which cause deadly diseases. Ticks are also a problem for the mighty mammal. Finally, humans are a top predator for the moose. Hunting and vehicle collisions are obvious issues, but so is deforestation and climate change. If the moose’s environment is destroyed, how much longer can we appreciate these incredible animals? 2. Did you know not all black bears have black fur? If you’re on the lookout for black bears, make sure you keep your eyes peeled for other fur colors besides black. Black bears actually come in many different colors—blue-black, brown, cinnamon, or even white. Another misconception? Black bears aren’t huge meat-eaters, in fact, they are mainly herbivores. Grass, dandelions, and berries are fan favorites from the furry mammals. But that doesn't mean they won’t go after a young animal or even another predator’s kill. And be sure to keep your cooler or picnic secure as human food can be a great attractant for black bears. While black bears range from Canada all the way down to the north of Mexico, Manitoba’s Riding Mountain National Park is a great place to find them in action. You may see this four-legged mammal sniffing out berries on the edge of a lake. 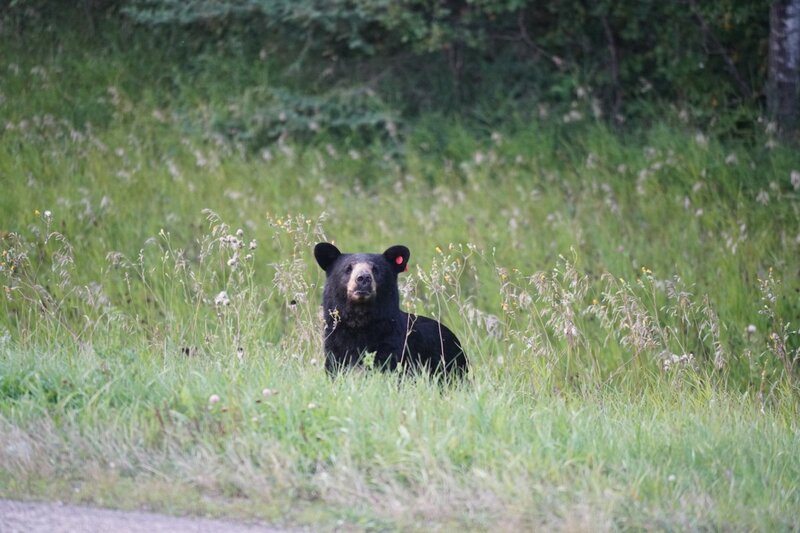 Or perhaps a mother and her cubs will be traversing through the bushes on the side of the road as you explore Riding Mountain National Park on a wildlife drive. And be sure to look up—black bears often hang out in trees. The bison’s story looked like it would be one of heartbreak. At one time, millions of the beautiful beast roamed the plains of North America. But after major habitat loss and unregulated hunting, the numbers decreased to only a few hundred. 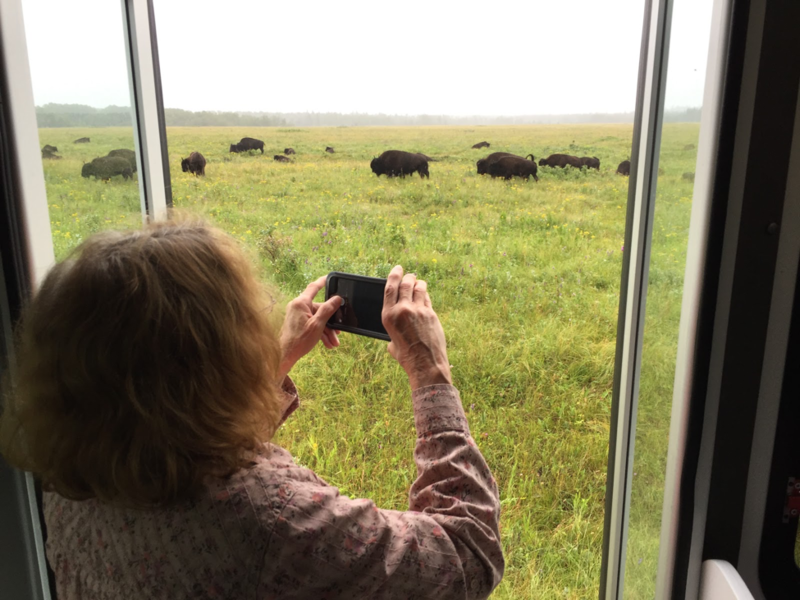 Thankfully, their story has a happy ending—bison numbers have grown significantly thanks to conservation efforts, such as the Lake Audy herd. In 1931, a herd was reintroduced to Riding Mountain National Park, and while that first herd did not make it, the second, introduced in the 1940s, has descendants flourishing in the region today. Bison are truly remarkable. They can adapt from the warm summer heat to the coldest blizzards across the plains. Maybe this adaptability is a testament for how they’ve made it through the last few centuries. 4. Summer sun means beluga fun in Churchill. nown as the “canaries of the sea,” belugas emit squeaks, pops, whistles, and chirps around other whales. And you’ll always see at least two belugas together. The whales travel together in “pods” or groups. You may be surprised to know that belugas are not born white. They are actually a gray-ish brown color when born and become white over time. Belugas are one of the smallest whale species and aren’t very fast swimmers, so there’s a great chance you’ll be able to see one on your safari. 5. Meet the true “King in the North”—the mighty polar bear. Although the polar bear population is highest around Churchill in the fall, it’s not unusual to spot a sleepy summer polar bear or two in the summer months. Canada is one of the best places to see polar bears in the wild, since two-thirds of the world’s polar bears are in Canada. In the winter, polar bears travel across the frozen ice of the Hudson Bay looking for food, which mainly consists of seals. They can go months without eating and are very strong swimmers. Females give birth in the winter, usually to twins. Their fur—which isn’t actually white, but transparent—covers black skin that absorbs the rays of the sun for heat. As much as polar bears are beloved, they are considered “vulnerable” as their habitat (the icy Arctic) is melting. If something is not done soon, their status could easily change to “endangered.” The good news? People are already stepping up to help this iconic mammal. Join a Conservation Journey to learn about one of the most loved animals in the world from species experts or get involved with Polar Bears International to save the polar bears’ habitat and Arctic sea ice. 6. Travel on safari in style with a Tundra Buggy®. Curious how you’ll get around the frontier of Canada while on safari? Look no further than the Tundra Buggy, a state-of-the-art vehicle made specifically for traveling over the tundra’s uneven and rocky terrain. Tundra Buggies have large wheels, keeping you a safe distance away from any curious creatures that come close for a look. They also have an observation deck in the back and large windows for optimal viewing. A official Tundra Buggy has the most access to the trail network in the Churchill Wildlife Management Area to explore the tundra while your driver provides interpretation about the colorful flora, amazing fauna and incredible history of this unique sub-arctic environment. Experience the summer scenery and scan the landscape for arctic fox, arctic hare, caribou and the first polar bears to return from their annual hunt on the sea ice. Churchill is also an incredible destination for bird lovers, with over 200 different species migrating through the area each summer. 7. Support conservation by supporting communities who give back. At the end of the day, seeing these amazing animals is just that—amazing. But what’s the point if we aren’t doing anything to make sure they are around for years to come? Choosing tour companies who give back to their communities and take action to improve their surroundings is vital for the future. Social responsibility and sustainable practices should be a factor when making decisions on where to go and who to travel with. Imagining floating alongside a pod of friendly beluga whales while they chirp and sing? How about a moose eating from the branches above? We’d love to have you on our “Big Five” safari this year. Answer a few brief questions here to get your own safari started today. Or sign up for our free email course for more information.